Abstract, (in Times New Roman 9 pt bold italics justified) This abstract in Times New Roman 9pt is justified. 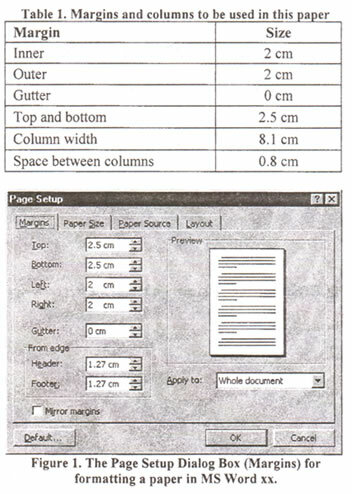 The main document below shows you your paper format. All you need to do is copy the entire file to your hard disk, print it for reference, overwrite this text with your own and save it as a file. Please follow the following instructions and the format of this paper to allow the final publication look professional and consistent. 1. Maximum length of the submitted paper is 8 pages for general sessions and 10 pages for Keynote & Invited lectures. 2. Paper submission is by e-mail only. The format of submitted paper is Word AND pdf following this template. Authors are requested to submit BOTH of them if possible, and to put the PAPER REFERENCE NUMBER in the main-body of the e-mail. 3. Whenever the authors contact the WESC Secretariat, please quote the paper number given by the Organizing Committee. This text is in Times New Roman 10-point. This template, complete with header and footer formats, should make it easy to lay out your paper for the proceedings. This template paper is supplied in MS Word format or PDF file. Older word processors should still be able to read it in the PDF format version. Text should be single-spaced. Styles in this template should ensure that you achieve the correct format with a minimum effort. The paper should be structured into an introduction, main body (presentation of the contribution, results, discussion, etc), a concluding section and the list of references. The page should be of A4 size (not letter or other sizes), with two columns and margins described in Table 1. For Microsoft Word users the Page Setup Dialog should appear as shown in Figure 1. Page numbers should be avoided. The editor of the final WESC Proceedings will put them in a consistent form for the final document. Graphic objects such as charts, photos and line drawings should be in electronic form and be pasted into the document directly. Floating frames are useful for convenient positioning of graphics. Original line drawing, photos, etc should be scaned before insertion. If possible, use either JPEG or GIF format graphic files as they are more compact than bitmaps like BMP or PCT. By all means use color if it enhaces the meaning of the figures. Text may be wrapped around figures if desired. Number your figures Figure 1, Figure 2, etc with a short caption under each 9-point Times New Roman bold to distinguish it from the main text. The style Caption should be used, as in template. Tables should be labeled Table 1, Table 2, etc at the top of each table, with a short caption on the top of each table in 9-point Times New Roman bold to distinguish it from the main text. The style Caption should be used, as in this template. Using units in the SI system is strongly recommended. The equation should be separated by a blank line above and below, and the equation number should be aligned on the right margin. Variables should be written with 10 pt in italic format in the text and equations. List here, where applicable, funding sources for the work described and other contributors. All publications cited in the text should be presented in a list of references by a number in square brackets on the line (e.g. Since Rehman ), and the full reference should be given in the numbered list at the end of the paper. Gumz W. Gas producers and blast furnaces. New York: John Wiley and Sons Inc., 1950.
thermoeconomics, report no. 62-36. Los Angeles. CA: UCLA Engineering Department, 1962. Sintak Y. Models and projections of energy use in the Soviet Union. In: Steiner T, editor. International energy economics. London: Chapman and Hall. pp. 1-53. Brabec CJ, Padinger R, Dyakonov V, Jummelen JC. Janssen RAJ, and Sariciftci NS, Realization of large area flexible fullerene-conjugated polymer photocells: a route to plastic solar cells. In: Molecular Nanostructures, Proceedings of the International Winterschool on Electronic Properties of Novel Materials, Kirchberg, 1998. European Wind Turbine Standards (EWTS) project. Petten, the Netherlands; ECN-Renewable Energy.